One of the leading differences between Northland Tool and Electronics and our competition is our grinding department. While many other spindle rebuilders send their grinding work to outside vendors we have made the investment in the machinery and the technology required to keep this vital service under our control. If our incoming evaluation shows a bearing shoulder that is not true we can place it on one of several grinding machines and kiss grind it true. Other rebuilders do not have that option and may repair your spindle with out of spec parts. We often use our grinders to evaluate shafts and housings for straightness and perpendicularity. This is not always possible to determine with the standard method of using V-blocks. Of course the main role of the grinding department is to grind-plate-grind any surface we have deemed out of specification. The quality that they provide to our customers in this area is bar none the best that I have ever seen. When you are talking about holding micron tolerances on spindle parts our guys are the best in the business! Our grinding/machining department supervisor was also our head technician for over a decade. This gives us a unique perspective on grind work as he knows exactly what can influence the performance of the spindle and he has trained all of his employees to look for any issues that may effect the spindle repair quality and longevity. He also works closely with the assembly team to share information and continue the teaching process. Not many of our competition have a team of people that work so closely together and have the amount of individual input we have regarding the repair process. 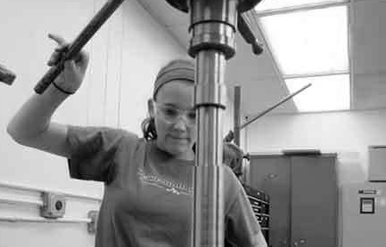 One of the most important steps in the rebuilding process is the breakdown and evaluation of the spindle. This is the phase where the cause of failure is determined. NTE pays particular attention to this function so we can help you identify problems early and work with you to find effective solutions. Have you ever had a problem spindle? Did your spindle run great for years but now it has inadequate performance after it has been serviced? More than likely something that is affecting its operation has been overlooked. NTE’s breakdown and evaluation process can help identify these problems before they wind up back in your machine and on your production floor. Every customer is important to NTE. We have a professional sales and technical staff to assist you with your individual spindle needs. Our goal is to find solutions to your spindle problems. This may involve a conversation or on-site visit from one of our sales engineers to explore solutions to your machine problems. NTE has comprehensive, in-house OD and ID grinding capabilities that are used specifically to bring parts back to OEM specifications. This allows NTE to maintain tolerances up to .00005” along with providing for shorter turnaround times and greater control over our repair processes. When you receive your spindle back from NTE, not only will you get the highest quality spindle repair, you will also receive a detailed report that includes run-out measurements, temperature readings, vibration analysis, break-in procedures, and other pertinent information. NTE has several unique and proprietary programs for customer support. You are provided with operational cost savings, extended spindle life, decreased machine down time, and, as a result, increased productivity. NTE goes far beyond repairing your spindle. Our support includes spindle care seminars, vibration analysis, lubrication system inspection and evaluation, contamination prevention analysis, cause of failure tracking, spindle upgrades, and much more. We provide comprehensive reports on what we have observed along with recommended corrective actions. When is a warranty not a warranty? When it is not honored! Along with having one of the most all-encompassing warranties in the industry, NTE is proud of the integrity it applies to ensure that you, our customer, are completely satisfied with the service you have been provided. To receive the maximum benefit from your BIG PLUS tooling your spindle must meet the same high quality standards you have come to expect from BIG PLUS. Northland Tool has worked closely with the engineers at BIG Kaiser to develop a repair program exclusively for your BIG PLUS spindles. Need an expedited repair? Call NTE! Due to NTE’s more extensive control of the rebuilding process, we are able to provide to you the quickest delivery in the industry.